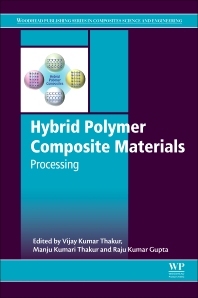 Hybrid Polymer Composite Materials: Processing presents the latest on these composite materials that can best be described as materials that are comprised of synthetic polymers and biological/inorganic/organic derived constituents. The combination of unique properties that emerge as a consequence of the particular arrangement and interactions between the different constituents provides immense opportunities for advanced material technologies. This series of four volumes brings an interdisciplinary effort to accomplish a more detailed understanding of the interplay between synthesis, structure, characterization, processing, applications, and performance of these advanced materials, with this volume focusing on their processing. Vijay Kumar Thakur is Permanent Faculty in the School of Aerospace, Transport and Manufacturing Engineering, Cranfield University, UK. Previously he was a Staff Scientist in the School of Mechanical and Materials Engineering at Washington State University, USA, Research Scientist in Temasek Laboratories at Nanyang Technological University Singapore and Visiting Research Fellow in the Department of Chemical and Materials Engineering at LHU Taiwan. He spent his postdoctoral study in Materials Science & Engineering at Iowa State University, USA. He has extensive expertise in the synthesis of polymers, nano materials, nanocomposites, biocomposites, graft copolymers, high performance capacitors and electrochromic materials. He sits on the editorial board of several SCI journals. Dr. Manju Kumar Thakur has been working as an Assistant Professor of Chemistry at the Himachal Pradesh University – Shimla, INDIA since June 2010. She received her B.Sc. in Chemistry, Botany and Zoology; M.Sc., M. Phil; in Organic Chemistry and Ph.D. in Polymer Chemistry from the Chemistry Department at Himachal Pradesh University – Shimla, INDIA. She has rich experience in the field of organic chemistry, bio- polymers, composites/ nanocomposites, hydrogels, applications of hydrogels in the removal of toxic heavy metal ions, drug delivery etc. She has published more than 30 research papers in several international journals, co-authored five books and has also published 25 book chapters in the field of polymeric materials. Raju Kumar Gupta is an Assistant Professor at the Department of Chemical Engineering, Indian Institute of Technology Kanpur, India. He graduated with a PhD from National University of Singapore (NUS), Singapore. He has received several awards such as DST Inspire Faculty Award 2013, IAAM Young Scientist Award 2014 and IEI Young Engineer Award (2014-15). His research interests include surface chemistry, green synthesis of nanomaterials, high dielectric constant materials, polymer and polymer-inorganic hybrid materials for electric energy storage, hybrid perovskite solar cells, electrospinning of functional polymers and nanocomposites for environmental and energy applications. A member of several international journal editorial boards, Dr. Gupta has authored more than 30 research articles in SCI journals, 2 books and 7 book chapters.